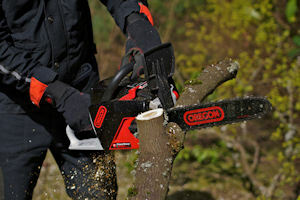 The cordless Oregon 40V MAX Chain Saw runs cleanly, quietly and is free from the hassles of gasoline or cords. Pull the trigger, and you have an instant start and long run time. Just charge the Oregon battery pack and you are always ready to go with lithium ion no-fade power. The exclusive PowerSharp precision saw chain-sharpening system is built into the unit, allowing users to sharpen the saw in seconds. The saw is part of Oregon’s Cordless Tool System, which also features a hedge trimmer and trimmer/edger.